Today, I'm taking a rest day. I am SOOOO sore! I didn't realize it'd been so long since I last wrote, because I have been working non-stop on the house project we have going on. I thought we were just about ready to prime the ceiling and walls, but then something else came up. As we were prepping the ceiling and walls, I thought more and more about removing the trim from around the windows, from where the wall meets the ceiling, and along the floor. It's very cheap, I don't love it, and I figured that if we are ever going to remove or replace it, now is the time to do it. Being a manufactured home, a lot of the building materials are definitely not meant to least forever. I had been planning to paint all of the trim while leaving it on the walls, but once I peeked behind it, I decided to remove it. I removed the trim around the ceiling, and it was a little shocking at first, but basically what I expected. The trim was used to cover the gap between the walls and ceiling (rather than finishing the seams). The gap was jagged and unsightly (Jerry said it looked like the builders had cut the drywall with a butterknife--hahaha). I thought about replacing the trim, but since I've been doing so much with drywall on the ceiling, I felt confident that I could tape and mud the gap. Yesterday, I spent 7-1/2 hours doing just that! It wasn't hard, but it was very tedious. I only used one coat of mud, and I'll need to do at least one more (maybe two) before it'll be ready to sand and prime. I'll post photos when I'm done. Interestingly, I don't feel overwhelmed. I'm actually really excited about doing this, and I enjoy working on it! I'm super sore, but that just reminds me that I've been working so hard. Which is why I'm using today to catch up on everything I've neglected--laundry, my blog, grocery shopping, etc--while working on the ceiling and walls. I guess it's not exactly a "rest" day, but it feels like it. I've been meaning to write about this for a while, and I keep forgetting about it. I'm coaching cross country again this year, and I wanted to think up some way to motivate the kids to want to run during practice and give their running some effort. You wouldn't believe how many kids don't want to run at cross country practice! 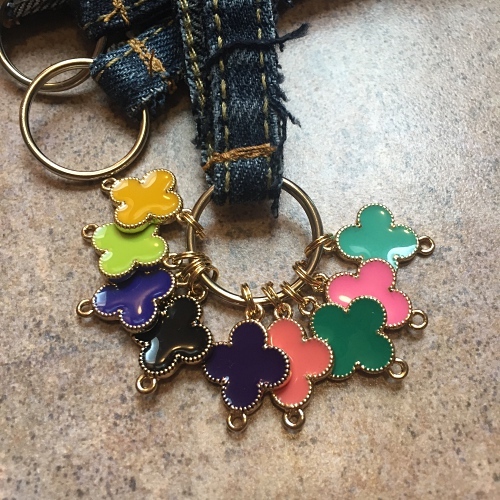 I got this idea when I was going through my jewelry box and came across my old Weight Watchers charms. I have charms earned from losing 25 pounds, 50 pounds, 75 pounds, and 100 pounds; a charm for reaching goal weight; a charm for hitting Lifetime membership; and a charm for an exercise challenge. Even though they were literally just silly little tokens to represent my hard work, it was exciting to get them! There are nine different colors of tokens, and each color represents a different achievement. Some of them are very elite, and some of them are easier, but all of them require effort. As the kids earn their first token, I give them the keychain with their token on it. And then if they earn more through the season, they can add to it. The whole purpose is to make the tokens difficult enough to earn that they will be a big deal. Nobody will be able to earn every single color (like not everyone in Weight Watchers is going to lose 50, 75, or 100 pounds), so the tokens are more elite than a participation award. That makes them more desirable; and, therefore, the kids will work harder to get them. The faster kids have their sights on the tokens that represent speed, while the other kids are working on building up their mileage and improving their own times. The age group that we coach is perfect for a system like this (we coach 3rd through 5th graders). And speaking of which, I have to head out now for our first race of the season! 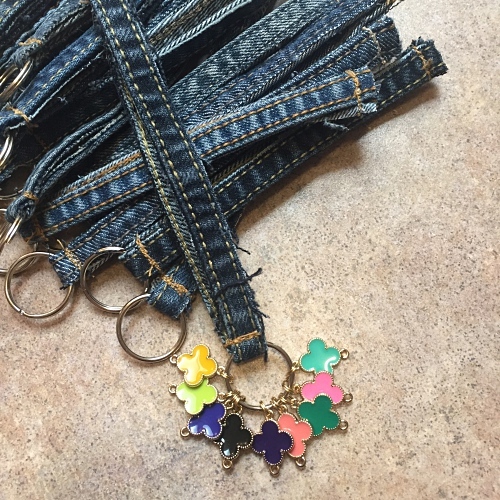 Can you please explain how you made the actual denim keychains? This looks like something that would be fun and easy to do as a SWAP for my Girl Scout troop and they could put it on their backpacks. It's really cute! It was super simple! (But sewing through the denim was a huge pain.) I just cut off the thick seams from the legs of old jeans (each strip should be twice the length that you want the keychain). Simply put one end through a keychain loop. Sew the ends together (this is SO difficult to do without breaking a needle or thread in your machine). Then you'll have a loop of denim with a keychain threaded on it. Then I pinched the denim together just above the metal loop, and I sewed across it to keep the loop at the bottom. Hopefully this makes sense! I didn't have to sew the jeans lengthwise at all--I literally just cut off the seams and used them with raw edges. Neat! It's really cute, thanks for explaining! Such a great idea and what a fun age group for coaching cross country! Love that idea! What a fun idea for the kids!! I also can't wait to see pics of how the kitchen is coming along! Sounds like so much work. But I'm sure it'll be all worth it!! That's really cool! I'm motivated to earn a few of those tokens now, lol! Hope the meet went well! I love this idea and the kids are just the right age to appreciate it! You are a great coach! Earlier this year we had mice chew through some waters lines in our attic causing major damage in a few area of our house. One half of our upstairs bathroom had to be completely gutted and redone. My husband decided to do the work to save us some money on our deductible, and let me tell you, it took months to finish! I helped mud and sand drywall in the garage, but left the bathroom to him because my skills are just not there for repairing that. We had some help from my step-dad, but it took forever and was so much work! I know you must be working your tail off!You will feel so accomplished when it is done. I can't wait to see the pics after you finish, but please keep sharing the progress pics! I really enjoy seeing your progress. Good luck! Love your cross country idea!! Mind blown! I’m a crafter but never ever would have thought of using Jean seams! Those are so cute. I just have to say that I've recently started following your blog and am so inspired by your positive attitude. Me and my boyfriend of almost 4 years broke up last weekend and I'm having a hard time with it. At the same time, I'm also a month into my journey to lose 80lbs. Reading your blog gives me hope and makes me smile. Thank you for all you do. This is awesome! I was on cross country in high school because it was the only team that didn't have cuts (at a school of 2500 where 400 girls tried out for 15 slots on the softball team I did not stand a chance). I was consistently dead last! For four years, I never beat ANYONE. But I kept coming back. It'd be great to recognize dedication and persistence in some way also and/or kindness (because those would have been the only charms I would have ever achieved other than finishing a race. I'm not sure even now that I could run a 9:00 mile). I am sure your kids are so lucky and so encouraged by you - you are doing an awesome thing for all of them! I love this idea!! !